Sweetwater, Texas (CNN) -- To win the Miss Snake Charmer beauty pageant requires beauty, grace, talent and a strong stomach. It's probably the only pageant in the country that requires the winner to decapitate and skin a snake. "Tomorrow I get to skin snakes and chop their heads off, and I am super-excited about it," said Laney Wallace, Miss Snake Charmer 2011. The pageant kicks off the annual Rattlesnake Roundup festival in this West Texas town. Hunters from as far away as Japan catch as many snakes as possible in the countryside then bring them to the county coliseum for the festival. "This event is a way for us to help control the population of the western diamondback rattlesnake in our area," says Donnie Willman, a volunteer with the Sweetwater Jaycees who run the event. The roundup began more than 50 years ago as a way to combat the rattlesnake population that was killing livestock and threatening pets and even people. "The rattlesnakes were literally coming into Sweetwater, down the streets looking for water," says Willman. "They bite livestock, they bite the animals, your pets. They'll bite kids, people. They're a very serious problem around here." The roundup has become a huge part of the town's identity. The Jaycees say 30,000 to 50,000 people attend the roundup each year. It's become as much party as public service event. "We have a lot of fun doing it. We enjoy it. We're all Jaycees back here in the snake pits," Willman says. After skinning their snake, guests leave hand prints in snake blood. Jeff Hulstein and Nathan Sheets left their wives at home in Dallas, Texas, and brought their sons to the roundup. They hired a guide to take them snake hunting and then brought their box full of snakes to the event. "We saw this as a rite of passage to be able to bring your boys out here and let them see how you have good clean fun and learn something and appreciate nature," says Jeff Hulstein. "It's one of the ways we are going to raise these boys into men." The guide uses gasoline fumes to drive the rattlers out of their dens. The dads then use long handled tongs and hooks to corral the snakes. Nathan Sheets says he has dreamed of coming to the Rattlesnake Roundup since he was a boy. "For me it's been a bucket list thing my entire life." Contestants in the Miss Snake Charmer beauty pageant try their hands at snake skinning. The roundup is clearly more fun for the humans than the snakes. The rattlesnakes are dumped into a large pen with hundreds of other snakes. They are weighed and measured and their venom is milked into glass beakers where it will be used for research and to make anti-venom. It goes down hill from here. Next comes the chopping block where their heads are cut off. They are then skinned and gutted. The meat is fried up and the skins are used for boots and wallets. 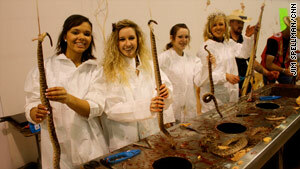 For $10, visitors can take a turn at snake skinning. To record their feat they rub their hands in snake blood and leave handprints on the wall. It's a little gory, but no one seems bothered, including Miss Snake Charmer 2011 Laney Wallace, who showed up to take her turn in the skinning pit. Miss Snake Charmer 2011 Laney Wallace takes her turn in the skinning pit. Tiara and sash in place and machete in hand, she steps up to the block and takes a swing -- and another, and another -- before the head finally comes off. Undeterred, she picks up the snakes body with one hand and gives a beauty queen wave with the other as cameras click away. "Only in Sweetwater," she says. "I would of never imagined in a million years that I would be Miss Snake Charmer. I'm so lucky."